Legendary jazz drummer Buddy Rich has been named one of the most influential drummers of all time by some of rock's biggest names like Neil Peart (Rush), Matt Sorum (Guns N Roses) and Kenny Aronoff (Chickenfoot). Buddy Rich's career lasted through five decades and his bands created some of the best jazz music of all-time. 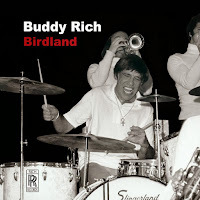 On May 26th, Scabeba Entertainment and Lightyear Entertainment in association with Lobitos Creek Ranch will release the album "Birdland," which features an unreleased live show from Buddy Rich and his Killer Force Band. The new eleven-song release begins with a three-minute introduction of "Mexicali Nose," which has the band firing on all cylinders, including a glimpse of Rich's powerful solos. The band quickly transitions in their most well-known number, "Birdland" as Rich's band takes center stage with amazing array of solos. Pianist Barry Keiner leads the way on "Just Friends" and returns once again for the ivory solo of "I Hear Rhapsody." The horns come blaring through the quick, up-tempo rhythm of "Three Day Suckers," before the evening's show closes with the familiarity of "Keep The Customer Satisfied."